I have a feeling that 2013 is going to be a good year. Ed’s fantastic Kickstarter goodies will be out around May, and I’ll be helping out with website. I’m really looking forward to seeing what he comes up with. For my part I’ll finally kick the WarSpike basic rules out of the door. It’s been a long time coming, but I hope it was worth it. Some of you may know that I’ve been helping out Ed over on Troll Forged Miniatures. Ed has been busy these last couple of years developing a new spin-castable plastic, that is hard (75D), heat resistant, and easy to work with. 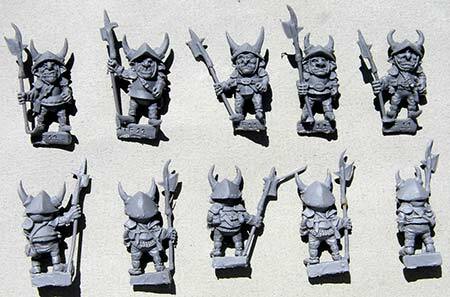 This new material is called Trollcast, and the first box set of miniatures has been released: Andrew May’s Armoured Halberdier Goblins. These Goblins remind me of the the 80’s classic film Labyrinth (staring David Bowie), with the wonderful custom and puppet designs by Brian Froud (and Ellis Flyte). They have quite a nostalgic feel to them, and at $10 for 10 the price take me back as well! Seems quite a few internet sites are going ‘black’ for the day in protest of the SOPA and the PROTECT IP Act (or the internet ‘blacklist’ bills, hence the ‘black’). I thought I would put up a post to encourage my American cousins across the pond to protest against these acts. Once again the internet makes this nice and easy; simply find one of the many protest forms on the net, many with the blurb filled in. Here is the mozilla.org one that popped up with firefox this morning (but anyone can use it). An here is wikipedia’s one. Update: Now that’s over, I can get back to writing up those game rules! The old gallery proved to be too much trouble to keep updated on a regular basis. With new fan made chapters turning up all the time (like Bolter and Chainsword’s Iron Gauntlet Challenge) I needed an easier way to keep it maintained. I wanted to separate the marines in the old pages into their individual pics, so I could reorder them, but will 1,000 marines this was going to be a bit of a headache. The only answer was to get a proper gallery system to handle this (and on that could automate alphabetical order would be nice). After having a look about, I plumbed for the excellent nextGEN Gallery plugin for WordPress. It seems pretty robust, but only time will tell if it (or my host) can handle 1,000 images in a single gallery! After playing about with the gallery a bit, I started converting the old gallery into the new one. This may take a while as I have to cut up all the old ’20 marines per picture’ pages into the individual marines and then upload ’em to the new gallery. I’ve managed 10 pages so far (I’ve no idea how Dazzo kept his sanity as this is incredibly tedious!) but I think it will be worth it in the end. Update: We are passed the 1,000 mark! The gallery has some interesting features, and one of these is image ‘tags’. Using tags you can create galleries that only show the images with a specific tag. I thought this would be very useful in dividing up the 1,000 chapters so that fans could quickly isolate the chapters they are looking for. Below is a gallery based on the tag “first”. Now that the Inquisitor theme I created for the blog is sorted out and applied, and synced with the prototype theme of the main site, I’ll be updating main site to match. This will mean that over the next week or two, as I update it in between running around, the main site will be a mix of old and new. This is a bit of a mess, as the menus do not match, but hopefully it will not be like this for too long. Edit (6 March 2010): All done. The main site is up to date! It was a serious mess under the hood, but is now the code is nice and clean (I may yet move all the pages to WordPress pages for easy management and added comments). This is the new theme for this blog and my main website. My aim is to merge the two. This theme is a complete re-write from scratch; I first created the template for the main site and then adapted it to a WordPress theme. I named this theme ‘Inquisitor’ after the fact looks like a giant ‘I’ (I was going to call it simply ‘I’, but thought better of it). Its style draws heavily from the main site, with a few touches from the old ‘Philverse’ theme, all pulled together and streamlined for a more utilitarian look. The familiar ‘drop cap titles’ are carried over, mixing old manuscript and modern typography which seems appropriate for 40K, combined with clearer layout. Browsers have come a long way, it was much easier to create the drop caps, so a lot of Div tags and what-nots have be ripped out. A lot lighter and quicker. The layout is not quite the same as the old blog as I removed the side bar, and all tracking information will be moved to a separate pages. I will add an archives page, and recent comments page later. My goal is to use this blog purely as a ‘news page’. I will update the main site later, once all the quirks have been ironed out here, with the updated theme. As with all new developments on my site, they are designed to make it easier to get around and view, so I am very interested to hear what you think.